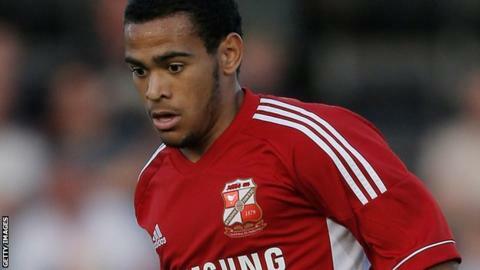 Swindon Town earned a surprising victory over promotion-chasing Brentford thanks to a first half Louis Thompson goal. The Robins earned a penalty when Alex Pritchard was felled by Alan McCormack but David Button denied Michael Smith. The hosts were ahead on half-time when Jonathan Douglas gave the ball away and Thompson coolly slotted home. Brentford finished with 10 men when Adam Forshaw was shown a second yellow for a foul on Rafael Rossi Branco. The result is Brentford's first loss in five but they remain in second spot, seven points ahead of third-placed Leyton Orient. Swindon move up to seventh place, seven points off the play-offs. "It was a proper game - like a cup final, end to end. Neither team left anything in the tank. "I thought first-half we were very, very good. We played a system that tried to catch them on the break, we probably could have killed the game by half-time. "Second-half we gave away too much possession, we didn't keep the ball well enough. "Once they got in the lead they had that mindset that they were desperate to hang on to it." Match ends, Swindon Town 1, Brentford 0. Second Half ends, Swindon Town 1, Brentford 0. Substitution, Swindon Town. Grant Hall replaces Raphael Rossi Branco. Corner, Swindon Town. Conceded by Alan McCormack. Foul by William Grigg (Brentford). James McEveley (Swindon Town) wins a free kick in the defensive half. Substitution, Brentford. William Grigg replaces Jake Bidwell. Hand ball by Tony Craig (Brentford). Substitution, Swindon Town. Miles Storey replaces Alex Pritchard. Corner, Brentford. Conceded by Jack Stephens. Attempt missed. James Tarkowski (Brentford) right footed shot from the centre of the box misses to the right. Substitution, Swindon Town. Ben Gladwin replaces Michael Smith. Corner, Brentford. Conceded by Nathan Thompson. Attempt blocked. Stuart Dallas (Brentford) right footed shot from the left side of the box is blocked. Attempt missed. James McEveley (Swindon Town) left footed shot from outside the box is just a bit too high. Attempt missed. Jake Bidwell (Brentford) right footed shot from the left side of the six yard box is close, but misses to the left. Second yellow card to Adam Forshaw (Brentford). Foul by Adam Forshaw (Brentford). Substitution, Brentford. Stuart Dallas replaces Marcello Trotta. Adam Forshaw (Brentford) is shown the yellow card. Alex Pritchard (Swindon Town) wins a free kick in the defensive half. Corner, Swindon Town. Conceded by Tony Craig. Attempt saved. Michael Smith (Swindon Town) right footed shot from outside the box is saved in the top centre of the goal. Corner, Brentford. Conceded by Troy Archibald-Henville. Corner, Brentford. Conceded by Wes Foderingham. Attempt saved. George Saville (Brentford) right footed shot from the centre of the box is saved in the bottom right corner. Tony Craig (Brentford) wins a free kick in the defensive half. Substitution, Brentford. George Saville replaces Toumani Diagouraga. Raphael Rossi Branco (Swindon Town) is shown the yellow card. Foul by Raphael Rossi Branco (Swindon Town).